Our Head Quarter village Dinsoft has 836 inhabitants. We have now a nice upgraded office. The next ten years we will concentrate on our expansion. We will try to grow as big as possible. First we go to extend our existing transport network to the neighbor villages. and later, when we have really a lot of money, we can found new industries by our own. The Operating Profit Graph shows now really an up going line. All our competitors are still around the zero line. Founding your own industry is very expensive. 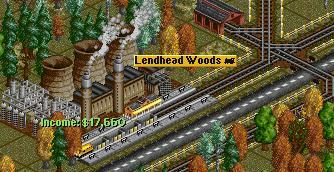 We go to open a new line from Dinsoft Woods to Lendhead Central, in both villages to a new Railroad Station. the distance is not so large, so we can use once more the smallest locomotive. After one month of operation we could replace the small locomotive by a faster one. Also in the mean time we received two important messages, one about the opening of a new coal mine, not so far from the Dinsoft Power Station and a message about a world wide recession. Such a World Recession means in general a decrease of production and a lower number of passengers and mail. The WWW Transport Company just decided to start a coal transport service from the new mine to the Dinsoft Power station. Total investments will be around a $200,000. We have only a $35.000, but when we build not to fast we will earn also money in the mean time. In September the new construction ends on the side of the river. A bridge is already more then $12,000 and we have only $10,000. No further construction is possible. We need to construct more rails and to build the railroad station . In addition we need a $140,000 for the train. This was the end of the first year of our "Expansion" cycle. 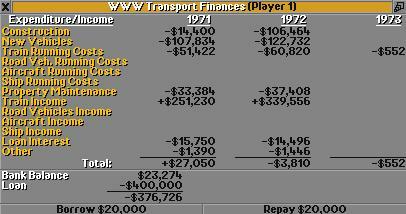 The train income is much lower than in 1969. This is due to the world recession. The number of transport passengers is much lower. Our bank account contains only $734. Also we have still the maximum loan. Since the passengers transport is still low, we did a bit a dirty trick and used the Dinsoft to Lendhead train for the coal transport. As you can see, the first coal transport earns $17,660 This are no peanuts anymore. With this money we can buy a few more coal cars. In May the recession is over. It's time. If we look to the Operating profit Graph, then we see that it went down very sharply during this recession. With the new coal transport it should improve very fast. We should not forget to buy a new train for the Dinsoft to Lendhead line. The old one is used for the coal transport. The next full coal train earned $20,398. 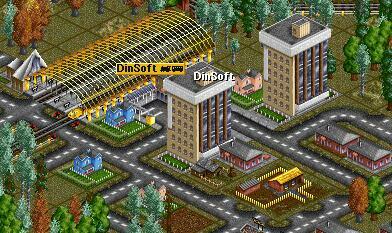 Some time later we got enough money to reorganize the railroad near the Dinsoft Power Station. We made a bridge and a new train depot. For the passenger's transport a small locomotive with one passengers car is used. Our earnings in the last year are about the same as the year before. remember, this is due too the world recession. For the year 1972 we expect a good improvement. 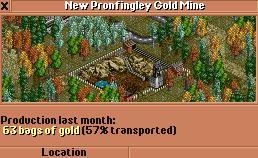 After a few months we saved enough money to start a new gold transport service from the New Pronfingley Gold Mine to the bank in Drontburg. 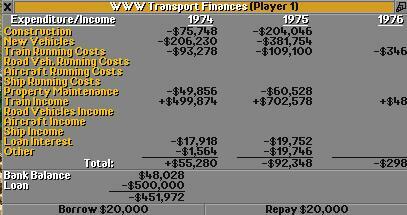 At the end of the year, after one gold transport the train earned about $4,000. Now the train has four armored cars and one trip earns $9,372. The earnings were in 1973 much higher the the year before. We had a few more trains and the world recession was over. Especial the coal train did it very well. This train earned even more than $100,000, two times more then the second best one, the train from Lendhead to Kendhattan. This year we can increase our loan to $500,000. In September 1973 a new passengers and mail service between Tronbridge and Tindhall is put in operation. The goal is to minimize the number of waiting passengers in Tindhall and to develop Tronbridge. 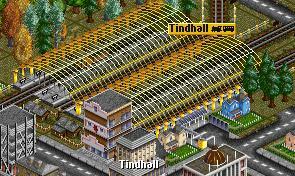 The rating of transport service in Tindhall was only 37%, this is very low. 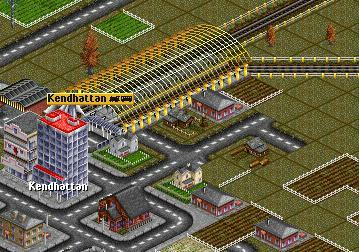 The railroad connection from Kendhattan to Slindwood was not properly constructed. In fact the rails went around some hills. Removing hill is very expensive, so it was cheaper to go around them. A few months age another company did some construction work near the Kendhattan railroad station and they removed these hills. For us a good opportunity to reconstructure our rail road. It is now quite a bit shorter. 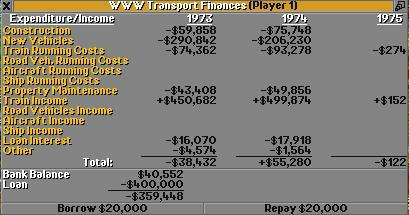 The train income increased to about $450,000. We had also a lot of investment in construction and new vehicles. The total is still negative. However the cash money increases now rapidly. We can continue to spend money on new investments. We have already some time a railroad station in Drontburg for the gold train. However, there is not yet any passengers and mail service. The service. The rating is 15%. So we go to setup this service from Drontburg to Kindingstone, at the other side of the river. Kindingstone has 184 inhabitants and is beautifully located on the river side. To increase the quality of service between Tronbridge and Tindhall the locomotive was upgraded to the 112 km/h type with a bit more horse power. Also 2 passenger cars were added to the train. A train income of almost $500,000. Earnings are increasing every year. The new year we will continue to setup new services and to improve existing one by replacing the small diesel locomotives by larger and faster ones. We just got a new food processing plant. It is located not so far from Tindhall. There is also a large farm with a high production not so far away. This means that the whole area has to be developed. This Food Processing Plant is a very good opportunity to make money. It is very close to a small village, Slarlingfield. So we can combine the delivery for the plant and the transport of passengers and food in one large railroad station. 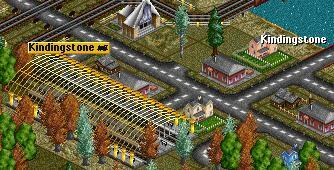 Near the farm we built a double railroad station, one track for the wheat and on for the livestock. Therefore we need also two trains, for the livestock and for the wheat. In addition we built on more station in Senfingly. To this station we transport the food from the Food Processing Plant. In the mean time we transport also passengers and mail, all with the same train. Train Senfingley to Starfingfield with two food transport cars. To speed up the trains we made a double railroad track between the farm and the food processing plant. To obtain maximum efficiency sign for on direction are used. In 1975 we put three new trains in service. Wheat and Livestock transport is a good business. The food transport could be combined with passengers and mail, this is also very economical. 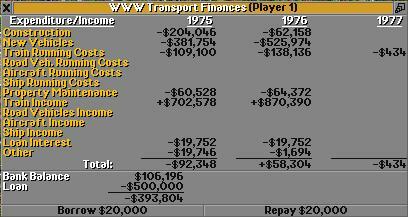 The train income increased with about 200K$, from 500K$ to about 700K$. 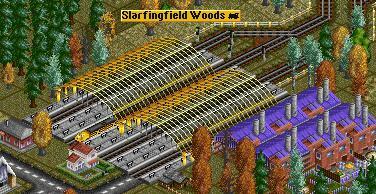 To improve the food and passengers transport the railroad station in Tindhall was enlarged and a new railroad was made between Tindhall and Starfingfield Woods. Now we can improve the transport rating in Starfingfield, which is a bit lower then 50%. With the extra train it will improve to 75%. Just before the end of the year we had enough money to replace the locomotives from the livestock and wheat train by a 112 km/h model. This was needed, because the transport rating on the farm station was very low, around 30% only. This new year we have to replace several of the small old diesel locomotives, they are too slow and they are getting old. For some new high efficiency investments we had a look on the map and found the city "Tatfield" with already more the 1700 inhabitants. WWW transport was not yet active there. So we built a large railroad station and laid a railroad to Nardinghattan Bridge. 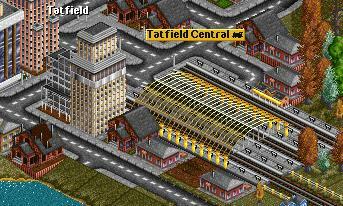 Both station are made 5 squares long, we aspect many passengers and need therefore long trains. The earnings of a long full train is around $15,000 per trip. In August 1977 we had the money to complete the train to it's full length. It can carry 6 times 40 passengers. The first of October there is a new locomotive available. It is a Dual Traction High speed Turbo Diesel. The price is $368,000, the speed is 160 km/hour. This is a very good one to run on the line to Tatfield. Let's wait until we have the money. Here is the Turbo Diesel which runs between Tatfield and Nardinghattan Bridge. The train income increased with about $250,000 to $1,123,360 The WWW transport has now 15 trains in operation. A subsidy was offered to us. Many times they are very bad, you have to cross mountains etc. this one is very good. It is in our active area and we have already two railroad station ready for this service. We have to build only the railroad tracks and the train. We got the subsidy. For each passenger transported from Overingway to Lendhead we will get 50% extra payment. Here is the new train, as soon as possible it has to be replaced by the new Turbo Diesel. The transport service rating in Senfingley is very low. to improve this we go to make a railroad to the neighbor village Slunningpool. This rail connection could be finished just before the end of December. The train has to wait till January next year. We are already in the last year of the "Expansion" cycle. Our earnings increased only with a$200,000. However, our bank balance becomes positive. We are not so far from the situation that we earn more than we can spend. Sounds good, isn't it? End of February 1979 the new train runs between Senfingley and Slunningpool. The first of march the subsidy we had on the passengers transport from Overingway to Lendhead was withdrawn. The train earned the previous year $43.000 and this year about $11,000. A subsidy does not increase the earnings a lot, but gives a good opportunity to start a new service. In the mean time we got another subsidy offer, now between Overingway and Pennville. 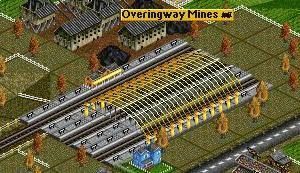 In Overingway we had already a railroad station for the coal mine. This one is relocated, closer to the city. Now it can be used for coal and passengers transport. The 15 the December the train is in operation. Of course we used again the Turbo Diesel. December 29 we got the subsidy.